While the actual number might be up for debate, the importance of technical talent is not. The most successful companies today are those that understand the strategic role that developers will play in their success or failure. Not just successful technology companies – virtually every company today needs a developer strategy. There’s a reason that ESPN and Sears have rolled out API programs, that companies are being bought not for their products but their people. The reason is that developers are the most valuable resource in business. How did we get here? How did developers become the most important constituency in business seemingly overnight? 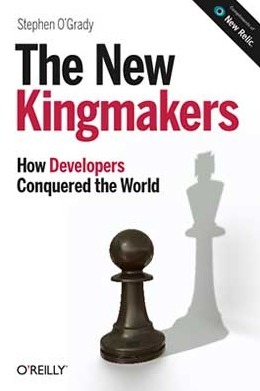 The New Kingmakers explores the rise of the developer class, its implications and provides suggestions for navigating the new developer-centric landscape. The New Kingmakers is the new book by RedMonk co-founder Stephen O'Grady chronicling the rise of the developer as the decisive force in the technology industry and sectors beyond. Published by O'Reilly and brought to you by New Relic, you can buy the book now from Amazon, Barnes & Noble or O'Reilly.